Veteran rock band Pink Floyd have been added to the list of acts appearing at next month's Live 8 concert in London. 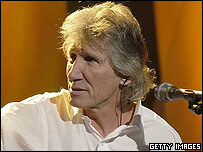 Roger Waters will be reunited with band-members Dave Gilmour, Nick Mason and Rick Wright for the show. The show, organised by Bob Geldof and Midge Ure to help fight African poverty, is one of five taking place around the world on July 2. Meanwhile, pop fans have until midnight to apply for tickets for the concert at Hyde Park. People wanting tickets have to text the answer to a multi-choice question to be in with a chance of winning one of 75,000 pairs of tickets. The winning tickets will be drawn at random by computer. The concert is an attempt to put pressure on the G8 industrialised countries to forgive African debt and increase aid budgets. Entrants aged 16 and over must send the answer to a multiple choice question to 84599 before midnight on Sunday. The question is: Which city is nearest to the G8 summit in July? A) Berlin, B) Moscow, C) Edinburgh. Entries are £1.50 plus the usual text message charge. Organisers also recently announced a concert in Edinburgh on 6 July, which will feature a line-up including Travis, Snow Patrol and Dido.